At the recent PyCon North America, I presented my lightning talk on coding in Python in a way that is sure to keep you employed. This was my first time presenting in front of an audience of thousands (2500, I believe), but I’m pretty happy with how it went. It’s embedded below, or it’s available over at YouTube. So to hear of the sudden death of John Hunter, creator and maintainer of Matplotlib was truly saddening. Matplotlib is one of those pieces of software absolutely instrumental in Python’s takeup as a language in the fields of maths, the sciences and engineering. When I was a student, I’d find myself using Matplotlib very often — it was the best there is. Tragically, John Hunter was in his mid-forties, and left behind a wife, and three young daughters. Numfocus has created a memorial fund to care for and educate his daughters. I’ll be contributing to this fund as a way of thanking the Hunter family for John’s contribution to my own work. Fernando Perez of IPython fame has written up a substantial post about John’s contribution to the community. PSF member, and PyCon US chair, Jesse Noller has also written a tribute to John. It’s a somewhat strange feeling — coming to realise the contribution of one person only after he died. Such is the way of Open Source — the impact of the tools we use and develop become more important than the people who develop them. And sometimes, developers are just happy to let things be that way. 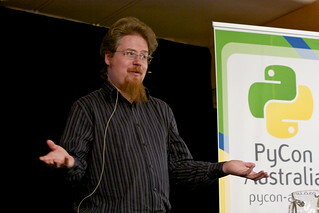 This past weekend saw the staging of the third PyCon Australia conference. It’s been a very long time coming, and the subject of countless hours of hard work by myself (chasing sponsors, arranging to fill a programme, and ensuring delegates attended the conference), not to mention my amazing co-organisers, Joshua Hesketh, Matthew D’Orazio, and Josh Deprez. We held the conference in Hobart, my home city, and the capital city of Tasmania – this follows two successful conferences in Sydney. Despite a lot of scepticism about Hobart as a venue for a conference, we managed to attract 240 signups (placing us somewhere in the middle of the first two Sydney conferences in terms of attendance (woo!)). 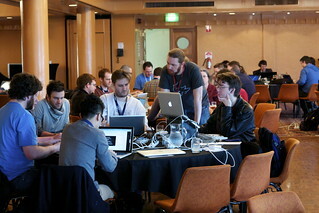 The first conference activity, the CodeWars programming tournament, started on Friday evening, with teams of up to 4 competing to solve programming problems against each other on projectors. This was a great event, which let delegates meet and greet each other before the conference started, and we’re very thankful to our event sponsor, Kogan, for helping us to make it happen. This year, we were graced by the presence of two overseas keynote speakers –– Mark Ramm, the current engineering manager on Canonical’s Juju project, and Kenneth Reitz, the chief Python guy at Heroku. Mark’s passionate and entertaining keynote delved into the murky waters of product management, and showed that applying the tools of testing and scientific process to product development and evaluation was something well in the reach of everyday engineers, even those with small projects. A smattering of war stories from his days leading product management at SourceForge rounded the talk off. It was a great way to start the conference, and it really helped set the informal, enthusiastic tone of the event. Kenneth’s talk dwelled on his philosophies of designing libraries in Python. He’s the developer of the python-requests HTTP library –– a library that has taken its rightful place as the obvious way to do HTTP in Python. His keynote gave us some strong insights into places where Python can make itself more accessible to newcomers, as well as being easier to remain involved for developers who use Python in their day-to-day lives. Kenneth’s presence was a great asset to the conference –– through his keynote, and also by making himself readily available to chat with delegates in the hallway track. 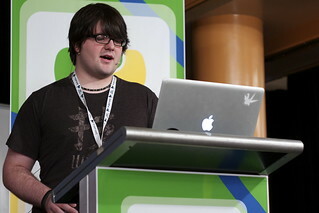 Hopefully we’ll be seeing him back at PyCon Australia in future years, with more of his Heroku colleagues. Our conference dinner was held at the beautiful Peppermint Bay restaurant near Woodbridge (some 30km South of Hobart); delegates were delivered there by the fast catamaran, the MV Marana. 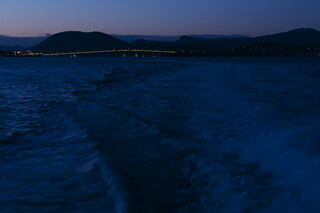 We saw some excellent views of Hobart at twilight – the silhouettes of Mt Wellington and the Hobart Hills were quite spectacular. Unfortunately, the river got a bit choppy near the entrance to the D’Entrecasteaux channel, which left a few of our delegates feeling a bit worse for wear. Luckily for us, the dinner itself was a fantastic evening of socialising, and finding out about other delegates’ interest in Python. It was a great event, with great food, and we’re going to have a lot of difficulty topping it. There are countless people who made an amazing effort to help improve our conference, including our volunteers, our speakers (some of whom stepped in at the very last minute to help improve our conference), Ritual Coffee (who produced their own custom blend for the conference, named “African Swallow“, no less! ), the venue staff at Wrest Point (especially Kelly Glass, who’s put up with my worrying about conference rooms for several months now), our sponsors (who helped to keep the conference itself affordable), and many many more. It’s helped make my life as an organiser so much more tolerable. Anyway, that’s it for now. I expect that I’ll have a follow-up to this post, dwelling on what we did right as an organising team, and how we can improve for next year. Incidentally, the conference will be run in Hobart again next year – if you’re in a position to help out with sponsorship, shoot me an e-mail at sponsorship@pycon-au.org, and I’ll get a prospectus to you as soon as possible! PyCon Australia early bird registrations now open! tl;dr: PyCon Australia early bird registrations are now open! 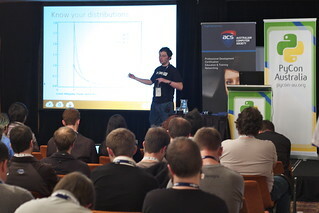 Find out more at http://2012.pycon-au.org/register/prices, including details of our accommodation programme. Hope we see you all registered soon! Talk — Android: The year of Linux on the palmtop? Here’s my talk from the Hobart TasLUG meeting yesterday (18 April 2012) on the features of Android from the point of view of a Linux user — both from a technical perspective, and issues arising from Android’s unique status as an Open Source OS for cellphones. If you want to download the video, you can download it, or watch it in the embedded format later in this post… Enjoy! Talk: I Can’t Believe It’s Not Java! Hark! My TUCS Tech Talk for this semester is an attempt to show the connections between Java as a programming and software technology, and the technology that followed it.